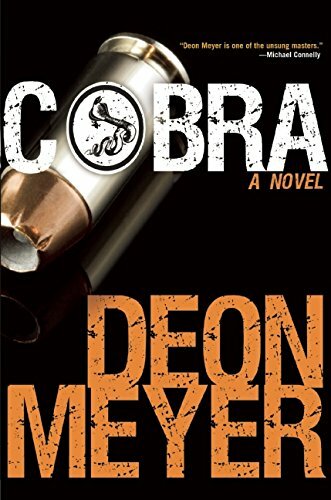 Deon Meyer’s latest novel Cobra begins with the bloody body count of three, all gunned down in the confines of an exclusive guesthouse in the beautiful Franschhoek wine valley of South Africa. However, two of those murdered are no ordinary victims. They are highly trained professional bodyguards, each armed with a Glock 7, supposedly guarding an eminent English mathematician going by the name of Paul Anthony Morris, from Cambridge University. Morris has now mysteriously disappeared, leaving behind not only his brand new passport, new suitcase, and new clothes, but more questions than answers. Was he abducted, to be held for ransom? Was he somehow involved in the killings? Is his name really Morris? Why was everything he possessed brand new, right down to his underwear? The only evidence of the triple homicides are spent shell cases seemingly left behind. Each shell comes with a chilling engraving: the flaring head of a spitting cobra. Everything, it would seem, points to a professional hit. But is it? Enter the man hoping to solve the mystery and bring the perpetrator to justice: Captain Benny Griessel of the South African law enforcement services, and also member of the elite Hawk squad of specially selected police officers. Griessel starts getting down to business almost immediately, and within a matter of minutes he smells more than a rat as he sniffs the Glock pistols’ barrels. Puzzlingly, no smell of cordite. Clean as a whistle, neither pistol has been fired. Is the killer this good, not even permitting professional bodyguards to get at least one shot fired? Griessel initially suspects a straightforward case of kidnap for ransom, but when the South African and British intelligence spooks start interfering with the investigation, the case takes on a more sinister implication. Meanwhile, in Cape Town, skilled, street-smart pickpocket Tyrone Kleinbooi is using his considerable talents to put his sister through college as well as pay her rent so that she may become a doctor. Tyrone is one of the best in the business and rarely makes mistakes. Unfortunately, sometimes mistakes happen to the best, and his masterly sleight-of-hand eventually becomes an accusing finger. One day he is caught in the act when he picks the wrong pocket, grabbing the wallet of a young woman delivering something very valuable and dangerous to South Africa. Security guards begin to question Tyrone, but within seconds of the interrogation, they are killed, possibly by the same assassin from the guesthouse massacre. The assassin soon turns his attention to Tyrone who unwittingly holds the key to stopping a deadly international threat. Griessel eventually realizes that the young pickpocket holds all the clues to this bloody and complicated case. But has he left it too late as the assassin closes in on Tyrone? This is the forth book in the Captain Benny Griessel series, the first being Devil’s Peak. Griessel is a fascinating and sympathetic character, flawed but with a great sense of humanity. He is a recovering alcohol and has been sober for a considerable amount of time (he was once so drunk during a murder scene, they had to load him into an ambulance along with the corpse!). Deon Meyer is now the leading crime writer in South Africa with an ever-growing international reputation of critically acclaimed novels; he is remarkably talented. After reading Cobra it is easy to see why he is popular. Gripping from beginning to end, Cobra is intricately plotted and filled with authentic dialogue and characters. Thriller writing at its best.